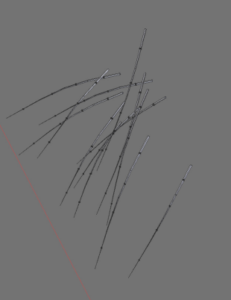 If you create small objects with disconnected sub-meshes, then you often get errors labelled as MAV_BLOCK Error when you try to upload your mesh to Second Life. The image aside gives a nice example of a single object that is made of many smaller disconnected submeshes. While there is nothing wrong with this mesh, the SL Importer often has trouble to import the mesh. The reason for this issue is hidden somewhere in the Second Life Upload process. We believe the reason for the issue is that the SL Importer deletes Submeshes when they become too small. Then suddenly a part of the Mesh gets removed and this can end in a situation where a complete texture face is no longer available in one of the LOD’s. Then the SL Importer runs into this issue. Create a simple mesh like a cube or a tetrahedron for example. The size of the mesh does not matter. Import your Mesh as usual. Now the upload should work.